Hope you are all keeping warm we have had frost today and the dogs here are all cuddled up together trying to keep warm. as the night ‘shave well and truly drawn in our thoughts turn to Christmastime I thought I would share a card that is a joy to make. First choose the Gilding flakes, I chose some with red flakes in but they come in all sorts of colours. I use cosmic shimmer glue and a piece of cut and dry foam. I spread the glue across the pad with a coffee stick I have a batch of these for using just for this purpose once the glue is spread and soaking into the cut and dry I then take my stamp and INK it with the glue…..if you see what I mean then taking your card stamp the glues image transferring the glue from the stamp onto the card …wash stamp…. then taking the card with the glue hold it over the gilding flakes and sprinkle over the card leave for a minute this lets the flakes set on the glue and then gently taking a rough sponge rub GENTLY off leaving the now gilded tree …I added a few red gems to mine but you can now do as you wish adding glitter or snow to the background…I used a Time Holz holly stencil at the back on my cardstock just to make it more Christmassy bit again it looks just as good left plain with a simple greeting Love this stamp I hope you do too and if you would like to order it I’m sure you would have it in time for those last minute Christmas cards. This entry was posted in News on 24/11/2014 by Bernie Simmons. This entry was posted in News on 19/11/2014 by Becki. Heidi here to share another project with you. I have made a Christmas wreath, using the lovely ‘Mae‘ stamp. The stamp, comes with a super little sentiment – ‘A little bird told me’. I have coloured the image in with Promarker’s and have coloured the little bird as a ‘Robin’. I have die-cut two large circles, attached ribbon to the reverse and have added lots of Poinsettia shapes from some fabulous gold sparkly card. Promarker Colours used : Mustard, Buttercup, Sandstone, Caramel, Ruby, Almond, Putty, Pastel Beige, Khaki, Pale Pink, Blossom Pink and Pear Green. To finish off, I have added some gold pearls to the centres of the flowers. Thanks for stopping by the blog today, I do hope you have enjoyed my little project today. This entry was posted in News on 19/11/2014 by Heidi Green. It’s my turn to post on the Blog, and so I thought that I would make a card using one of the fabulous Hobby Art poppy stamps to commemorate Remembrance Day. Of course it also fits very nicely with the new Monthly Challenge that Jenny has just launched. 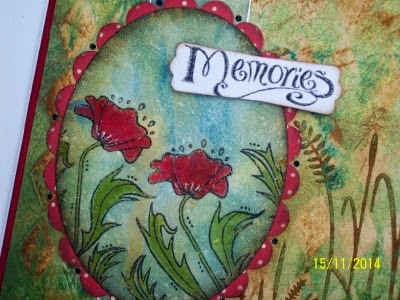 For the first challenge she is asking you to make a card/project using the theme of Poppies and/or Remembrance. 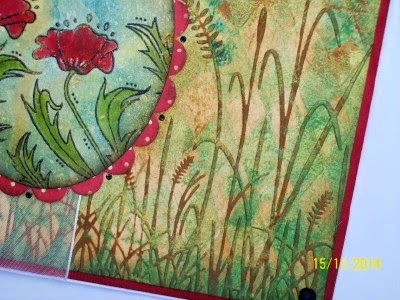 The main panel on my card has been created using one of the Poppy stamps from the Poppy Scene It set. I have stamped and embossed the images on to a piece of handmade background paper and then coloured it using Distress Inks. 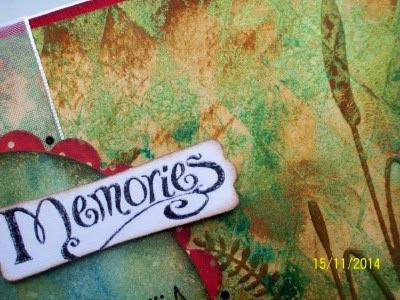 The sentiment is also from the same set although I masked off the embellishment above it when inking the stamp. My background paper has been created using my trusty Gelli Plate, some green and gold acrylic paint and a stencil. I sponged this panel with brown Distress Ink before dry embossed it using an embossing folder. Once embossed I passed the same brown ink pad over the entire piece which highlighted the embossed images. Hopefully you can see the gold acrylic paint a little better in this photograph. I added some tiny peel-off dots around the oval die cut frame and also some hand drawn dots at the side of the stems on the stamped panel. I hope that you will join us in our new challenge, but remember that you must use Hobby Art stamps. There are lots of lovely ones to choose from, so I shall look forward to seeing what you come up with. Happy stamping, and have a great weekend. 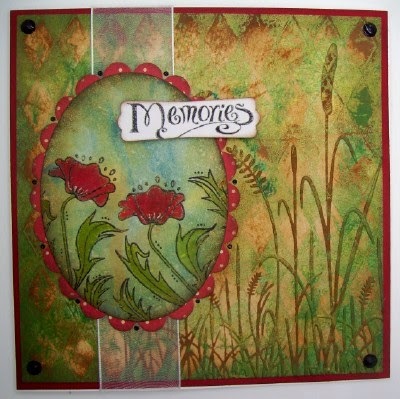 This entry was posted in Blog Challenge and tagged acrylic paint, challenge blog, distress inks, embossing folder, gelli plate, poppies on 15/11/2014 by Kim Reygate. So you all have been working very hard to bring us lots of gorgeous cards and projects for our first Blog Challenge! This Gorgeous card was made by Debbie Cudley. These Gorgeous cards were made by Sonia Murphy. This Gorgeous Tag was made by Veronica Pell. This Gorgeous card and candle was made by Julia Bettinson. This Gorgeous box was made by Moira Walters. This Gorgeous clock was made by Christina Stather. These Gorgeous Scrapbook pages were made by Maria Dickson. This entry was posted in Blog Challenge on 11/11/2014 by Becki. I was at the NEC for two days Last week Thursday and Friday … Up and showered at 4 am. I left home at 5am despite a very long and stressful journey I reached NEC at 10.45….while on the journey up I could SEE if you like in my minds eye, a card very different from what I would normally do. I asked Jenny If I could have a play to see if I could get it onto paper and Friday was given the chance not just to get it onto card, but to demo it on the stand while doing so now…..I have never demo’d Oh I run workshops but my peeps all no me so there is no fear! Added to the fact I have never rehearsed or even had a dry run on this card and here I was doing it live …..Hands shook and heart thumping I began going back to basics I stamped the poppies from the Poppy Set first as though they are cascading from the sky and angels hands then masked them with paper ….no post it notes! then stamped the Grey Rubber Angel over the poppies not perfect but hey work with it. Clouds next making one of my masks out of card and using brushes being careful not to go over poppies or angel ! I gently put the clouds in where I wanted them to be using Tumbled Glass distress inkpad and brushes. That done I stamped the soldiers from the Commemorative Set silhouette in first generation In k(Black)k at the front bottom of the card then in second and third generation ink behind to make it look as though there were a lot of soldiers not just one line. Then went about colouring the poppies and angel and stamped REMEMBER at the top matted and layered in red and black card and job is done. To all who have served and still do I thank you without your sacrifice we may not have the freedom to curse the cows on the line or enjoy the freedom we so often take for granted today. This entry was posted in News on 10/11/2014 by Bernie Simmons. Good morning, here is another blog project from me, Heidi. I have used the wonderful ‘Robin’s and Berries’ stamp set, recently launched. I love to dabble in all things card and shaped cards and mini books are so my thing. I have been asked several times about how to make my little star-albums and as I do love to make them, here is a short tutorial for you to follow. They make great little gifts, if left blank partly inside, photos can be inserted and they can be made into small brag books. Here are some of the inside pages, using other images from the set also a great sentiments set called ‘Winter Wishes’. I have used lots of brown ink inside and out, to age the album. Tools : Scissors, Double-sided tape, Sticky Pads, Trimmer and Scoreboard. (1) Cut five oblongs of red card to measure 8cms x 16cm, score all in half. (2) Cut five oblongs of kraft card to measure : 7cms x 14cms, score in half again. (3) Cut five oblongs of white card to measure : 6cms x 12cms, score in half. (4) From kraft card, cut another oblong to measure : 8cms x 18cms. This is the book cover. (5) Score at 8cms and 9cms and then stamp small ‘holly’ image over one side. (6) Using red and kraft card, stick edges together using double-sided tape, put aside. (7) On white card oblongs, stamp up images and sentiments, colour in. (8) Stamp up two of each robin images, colour in and cut out. (9) Attach baker’s twine centrally to outside parts of mini-star album. (10) Stick outside cover over twine, firmly. (11) Attach robins inside and out. (12) Add glitter glue to berries, leave to dry. I do hope you have enjoyed my blog-project today, thanks for stopping by. This entry was posted in News, Tutorials on 05/11/2014 by Heidi Green. I absolutely love these little greyboard gifts as they are so easy to decorate and I was so happy with the finished result. Ironically I made this about the same time I made my (first project) the Owl Heart and this was originally going to be for that. Then Berries and Birds made a 2nd appearance on C&C so this got transformed using that set but the owl wooden tag is interchangeable. So after doing my initial experiment with the trees (2nd Project) this is along the same lines using acrylic paint and an embossing folder. 1. I painted a piece of Kraft Card using Tim Holtz Distress Paint (Frayed Burlap) It has a dauber applicator making it very easy to use and you get a smooth even finish. Wait until dry. Don’t even admire your work of art until after you’ve cleaned the embossing folder. Otherwise you may stain it. Granted it shouldn’t affect the use of the folder and acrylic paint does pick or peel off when dry. But if you are precious about clean craft stuff this technique may not be for you. 2. 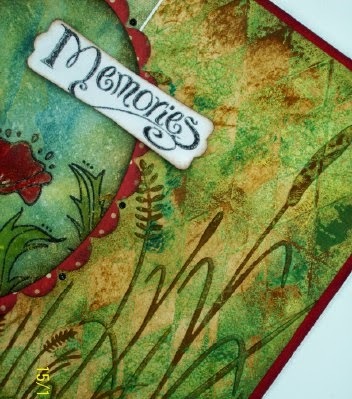 Ink up your embossing Folder with brown Acrylic Paint. Make sure you paint on the right side on the embossing folder. The raised part will be Frayed Burlap colour. 3. So here is the finished background. I just love the finished effect it has the texture and colour. I actually did this 3 times to cover the 3 showing sides of the Printer Tray and, trust me, you get quicker and it gets easier everytime. Then I trimmed the kraft card down to fit the cover on the Printer Tray. Keep the scraps as you can cut a thin bit to cover the spine of the printer tray. 4. As you can see I’ve attached ribbon on the outside (both sides) before sticking the bark cover over the top. You don’t have to go as crazy as me with the adhesives but I always overdo it as I know it’s going to be handled a lot and there would be nothing worse than the ribbon randomly falling off. 5. So once you have done the outside, time for the inside bit. This is included in the Printer tray. For this project I cut off the apertures. (see picture above) This is easy with a sharp scalpel (please still be careful) You have 3 apertures (you need to cut all 3) The painted pieces need to be stuck together and then stuck to the base. 6.For the inside I painted Frayed Burlap on the inside spine and the edges that hold the open aperture even though the aperture will cover most of it it is slightly smaller than the outside edge. 7. The aperture that has been cut to hold the tag I painted with Brown Acrylic Paint and inside I placed a dark brown paper to the base. 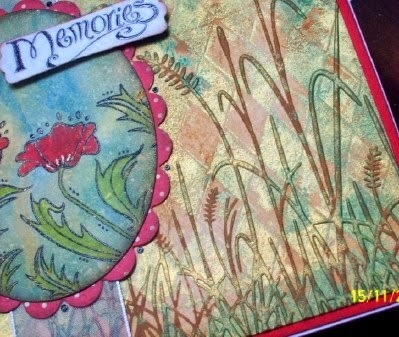 I then stamped and coloured using stamps from the Berries & Birds Stamp set. Now just put in your Wooden Heart Tag. This entry was posted in News, Tutorials on 03/11/2014 by Becki. Welcome to our first Blog Challenge! It’s the start of November and soon to be Remembrance Sunday. For our first challenge we’re asking you to make a cards (or project) with the theme of Poppies and/or Remembrance using any Hobby Art stamps. Here are a few stamps that may inspire you. The Royal British Legion was founded by veterans of the First World War who adopted the poppy as their symbol of Remembrance and hope. We thought this challenge is a good one to start with and also to commemorate 100 years since the beginning of WWI. or post onto Facebook or Twitter and say it’s for the November Blog Challenge. As this is our first challenge it is a learning curve for us too. We may add more information/rules, if necessary, for the next challenge. This entry was posted in Blog Challenge on 02/11/2014 by Becki.